"Puts the country to shame"
Not Verified | Terrible airport. Rude staff, who outright lie. Ridiculously long immigration queues, even for those with an onward boarding pass. I was last here in March 2017. Missed my connecting flight because immigration queue was 1.5 hours (1.5 hours!). Tried to speak tomorrow staff. One lied to me and said that the connecting flight was also delayed - not true, as it turned out. One simply looked at me as though I was crazy and said "I don't know" when I asked her a question, and walked off. I have gone out of my way to avoid this airport since, but was forced to use it again. Sincerely hope that this proves to be a better experience. Puts the country to shame, unfortunately. 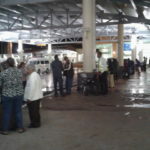 Not Verified | On arriving, travelling with my Trini wife and child, I was met with a substantial queue to immigration. There was this very empathic and helpful immigration lady ushering people along. She saw our plight, along with other families with children and expedited our movement through immigration. On return, at check in, this positive attitude to assisting passengers was also evident with the handling clerk (we also had an internal Caribbean flight during our stay and the check in staff was exceptionally helpful, as we had left an important document at our accommodation and had to get a copy whatsapped over). My only criticism is the system whereby a trolley is available free from the baggage area, but you are only permitted to use it as far as the entrance/exit to the airport, after which one must either carry your baggage to the transport or pay a trolley porter $8 US to move your baggage perhaps 20 meters. It's nice that in the Departure Lounge one can obtain such essentials as Royal Castle Pepper Sauce and Mudder in Law Chadon Benni pepper sauce. It would have been nice to see a fast food outlet in the departure lounge itself, though some people had little difficulty bringing food through from the food court by the entrance. Security was efficient, no issues there. Loud speaker announcements were entirely incomprehensible and impossible to understand (this must be a trait in airports). "So much for being a family friendly airport"
✅ Trip Verified | Generally the airport is fine except in the past couple years. I travel to Trinidad 1-3 times a year to visit my family. What had me most surprised is that there is now a separate line for men, even when traveling with a family. All women and children go through a separate line. You can imagine which line is ridiculously long while men sail through or security at the men’s line just hang out. Is this the Middle East? We just went back a few steps in equal rights. So much for being a family friendly airport! Don’t forget the usual Trini rudeness of the security staff. 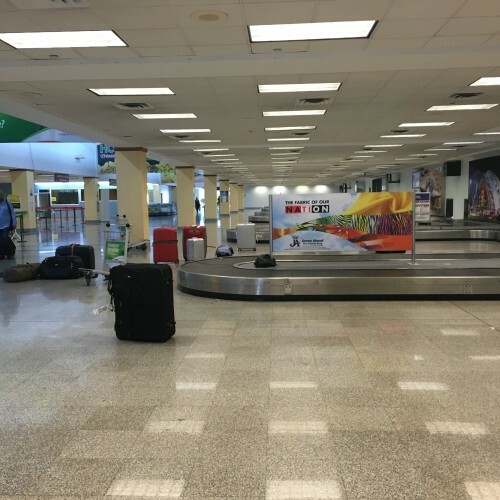 "provide better and quicker accessibility"
✅ Trip Verified | I had about 6 hours layover in Trinidad, so I was able to leave the airport just for a few hours with my child. 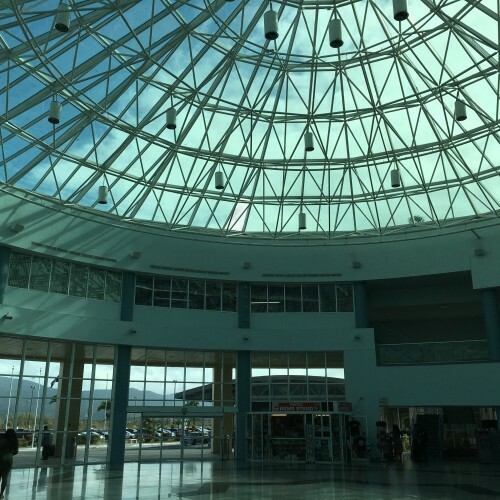 We flew on Air Canada, so we got there some time after midnight and the plane was scheduled to depart at about 6 am for Guyana on Caribbean Airlines. While we left the plane, I had to hold my child which was too heavy (she's not walking) and it's frustrating for me and other parents, we were told to wait in this area after going down. Nothing and we (me and other parents) were waiting for some time, then we waited before Customs wondering about the strollers! Then we had to go through Customs in order to get to Baggage Claim. It was terrible even some staff were not helpful or it was just one then finally we got our strollers. It was terrible, imagine those in wheelchairs! They would have suffered the same if they had to go through all that like I did. It was obviously exhausting for already tired people like me Please provide better and quicker accessibility. I'm not a huge fan of this airport. This airport is not big but it is a busy airport. Inside the airport is clean and well managed. Staff are fast. No need for long waiting times at the security check or at check in. Inside there are only a few shops. Before the security check there is a food court with a large variety of food choices. 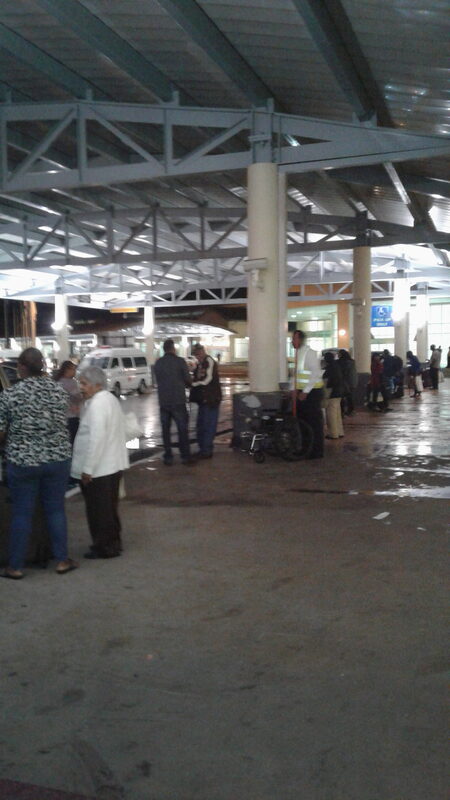 Landed from St Lucia at 4.50 pm, 2 hours waiting to get through immigration. Only 2 "officers" at times on visitor section with hundreds of people queuing. BA flight landed as well so many would have had a 10 hour trip via Antigua from London. I was only in transit for a flight to the USA in the morning and was just staying overnight at the Holiday Inn. Staff were letting random people through the disabled section (I suspect people who had phoned friends who worked at the airport). There were no announcements as to why there was a delay just a surly female "officer" telling people to stop using phones to call people waiting for them outside. Poor immigration service. 3 hour waiting in line to get through immigration services. 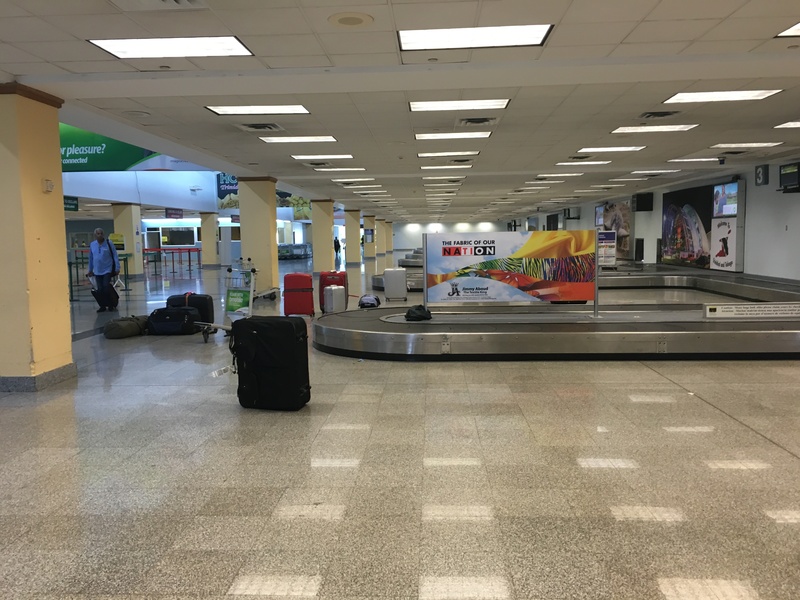 Airport not notifying complaining passengers about delay. Personnel just standing around not trying to fix situation. Transit passengers losing their flight connections. 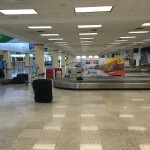 In transit at POS airport from Miami to Georgetown Guyana. Nice terminal - was here in 1992 and its majorly improved. 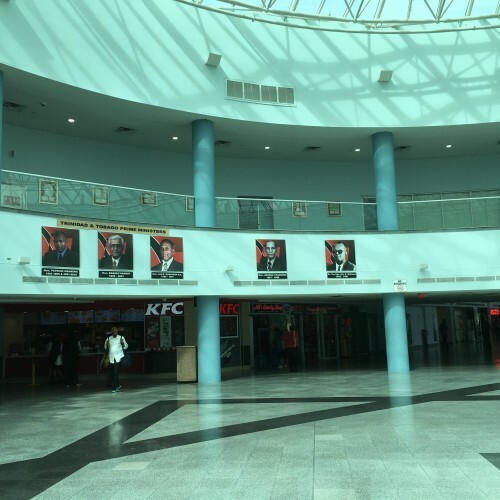 Not enough places to sit pre-departure area but KFC and Subway for food and some other coffee and souvenir shops. Upstairs is a little restaurant with a nice view of the terminal and runway. Free wifi is great and fast - so no real complaints. A/C is working fine so its cool and comfortable. People are super friendly - everyone I asked questions of answered me with a smile. Horrible airport; only 20+ years old but already old and worn (and not clean). Trolleys not allowed after customs so if you travel with kids and bags tough luck you will just have to sit in the junk food area or by the check in counters until your connecting flight. Be prepared to go hungry or eat junk food. If you decide to circumvent the waiting part make sure you got USD180 or more as USD100 may get you a hotel without water or with a non-flushing toilet. 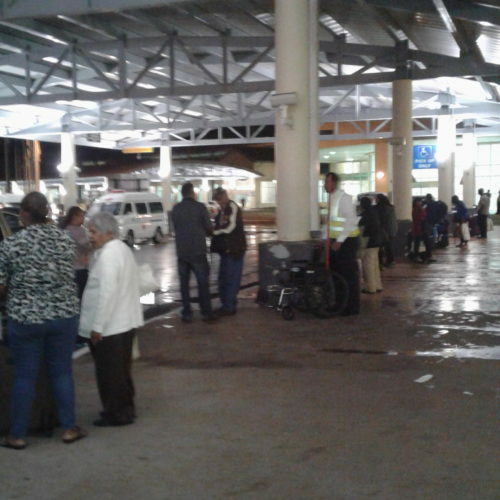 If you have a late lay over (ie an incoming flight from Jamaica or Barbados to continue to Guyana or Suriname) buy food in Jamaica or Barbados b/c after hours everything is closed and Caribbean Airlines does not give food on these flights. Actually much better than expected. Check-in a breeze mainly if you did online check-in security is hard immigration is polite but also asks to see all your papers etc. It is a clean airport lots of shopping and duty free shops - the prices are high. I used both domestic and international departures and both are OK but will soon need an update.